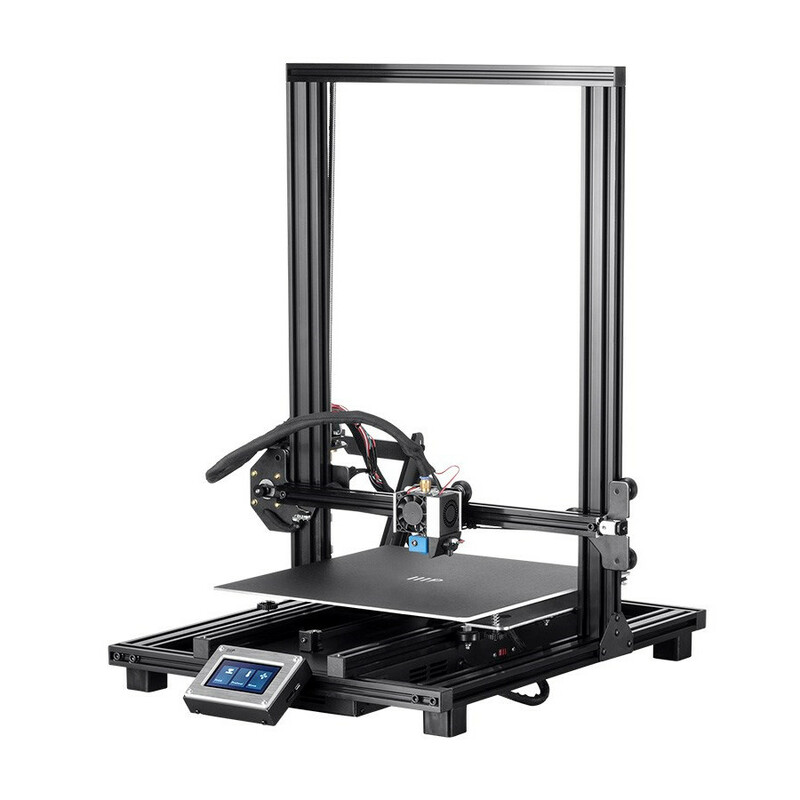 MA10- Auto Level, Touch screen, 300x300x400mm The MA10 provides a roomy 300x300mm print bed for makers to stretch across and a generous 400mm print height, allowing you to make large, complex models. 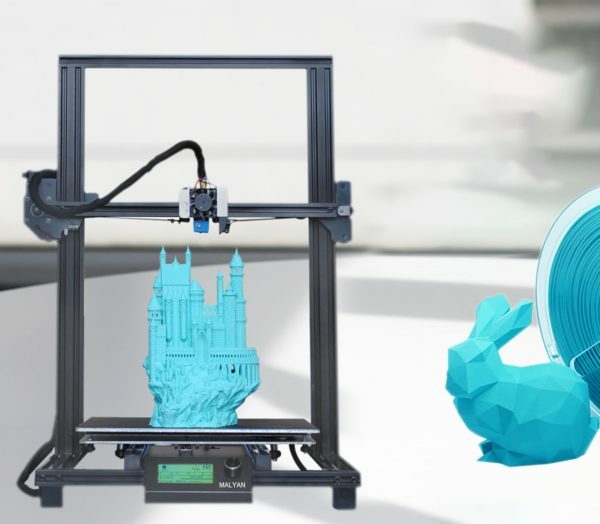 It is one of the easiest 3D printers to use with its LCD touch screen, auto bed leveling, auto restart after any power failure, and a flexible, removable magnetic build sheet, allowing for easy removal of finished prints. 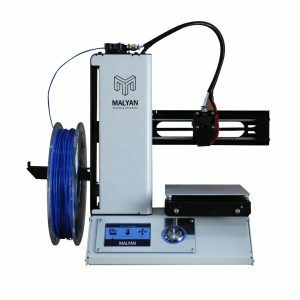 The steel construction provides a rigid structure for the extruder to travel along, allowing for greater motor accuracy and better quality prints. 300x300mm Build Area: The MA10 provides a roomy 300x300mm print area for makers to stretch across and a generous 400mm print height, allowing you to make large, complex models. Whether you are printing multiples of a single piece or taking advantage of the extra space with a single print, beginners and more advanced users can get behind its ease of use from start to finish. Auto Bed Level: Bed leveling a large plate can be difficult. Auto bed leveling makes the process as easy as following the prompt on the LCD touch screen. Auto Resume: If the machine loses power while printing, there is no need to worry. 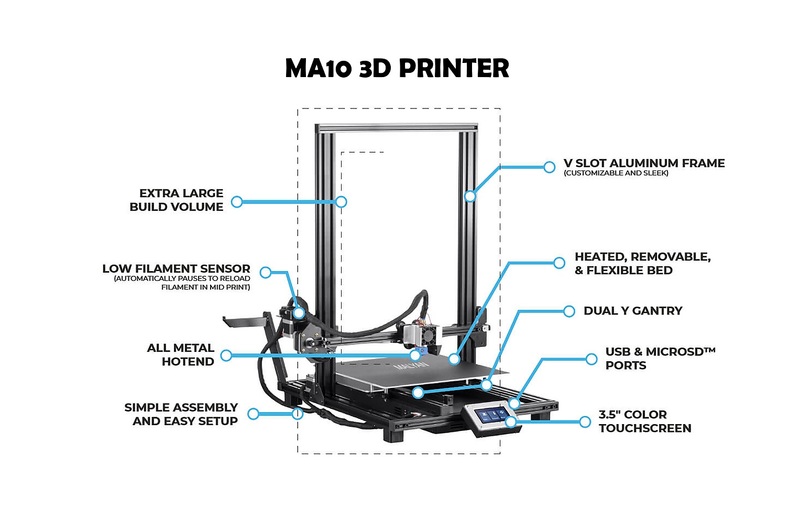 The MA10 allows can restart the print from from where it left off, saving that 30 hour print you’ve been dreaming of. Whether it’s a power outage, trip on the cable, or somebody turning off your printer, the print can be saved. Flexible Magnetic Print Sheet: Finally, a nice finish. The flexible, magnetic build sheet allows for easy removal of prints, with minimum effort. 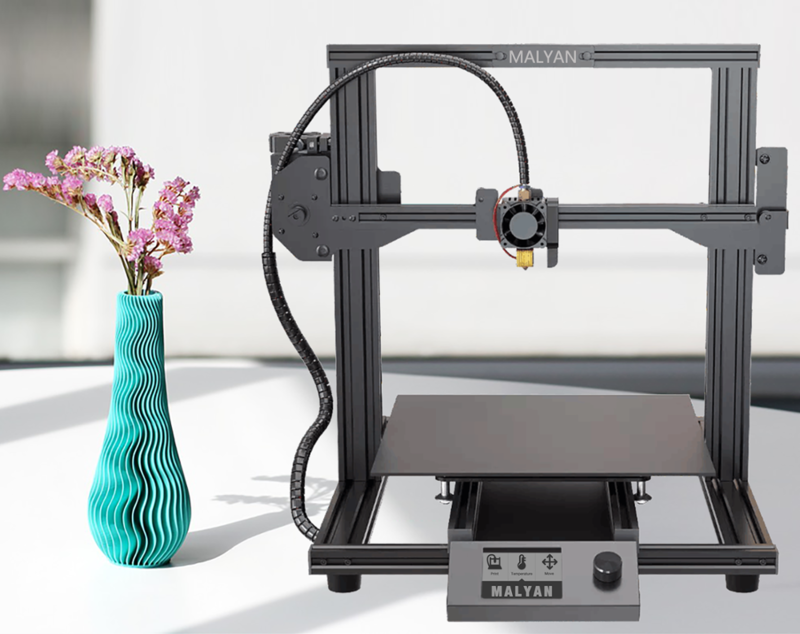 Simply take the sheet off and flex it under the model to detach the model..
•300x300mm Build Area: The MA10 provides a roomy 300x300mm build plate for makers to stretch across and a generous 400mm print height, allowing you to make large, complex models. Whether you are printing multiples of a single piece or taking advantage of the extra space with a single print, beginners and more advanced users can get behind its ease of use from start to finish. •Auto Bed Level: Bed leveling a large plate can be difficult. Auto bed leveling makes the process as easy as following the prompt on the LCD touch screen. 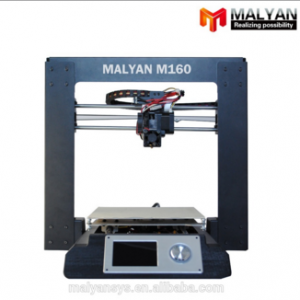 •Auto Resume: If the machine loses power while printing, there is no need to worry. 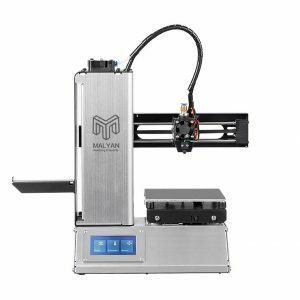 The MA10 allows can restart the print from where it left off, saving that 30 hour print you’ve been dreaming of. Whether it’s a power outage, trip on the cable, or somebody turning off your printer, the print can be saved. •Flexible Magnetic Print Sheet: Finally, a nice finish. 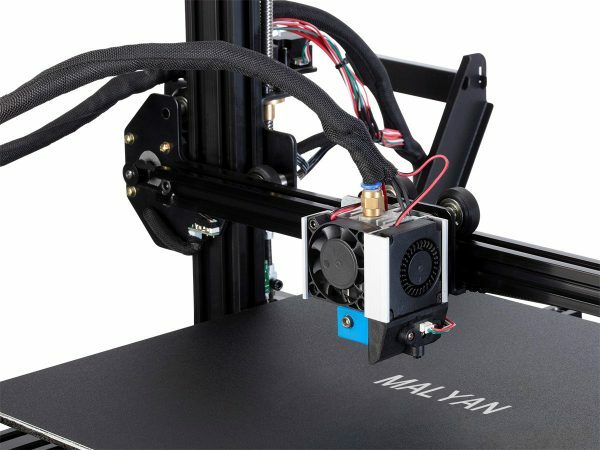 The flexible, magnetic build sheet allows for easy removal of prints, with minimum effort. Simply take the sheet off and flex it under the model to detach the model. 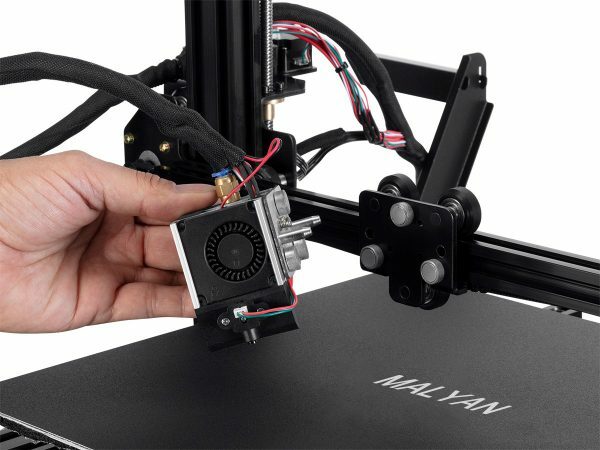 Then, just place the sheet on the heated built plate and start your next project! •Size Matters: The extra-large build volume and tiny layer heights make this printer capable of producing amazingly detailed objects in large formats.